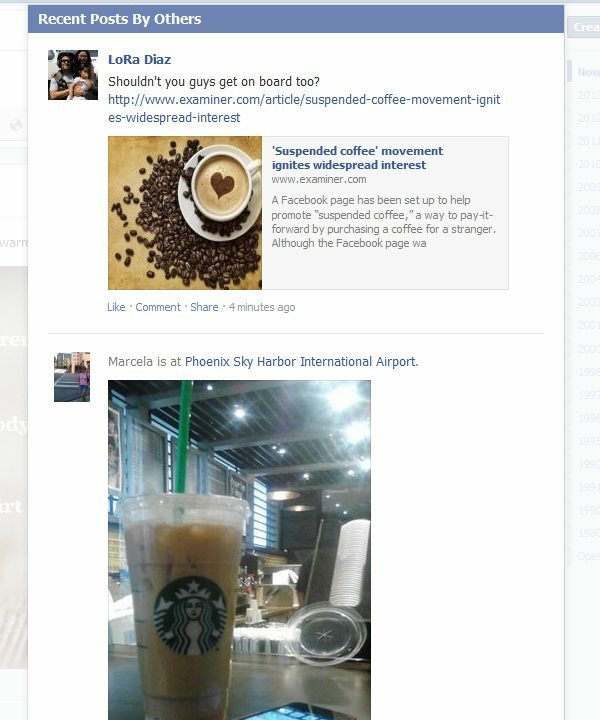 Suddenly, the idea of a “Suspended Coffee” is a huge viral hit on various social networking sites. The gist of it is that a customer orders more coffees than he or she intends to actually consume. The extras are considered “suspended.” The barista can gift the suspended coffees to a customer in need. Attached is a screen cap from the official Starbucks Facebook page. People are talking about “Suspended Coffees.” On MyStarbucksIdea.com, there are numerous threads about “suspended coffees.” You can take a look at MyStarbucksIdea.com threads on “suspended coffees” here, here, here, and here. And there are plenty more, if you use the search box. Trust me, the topic of feeding America’s poor and hungry is one that I take great interest in. I’m going to give you my analysis and commentary as best I can. Feel free to disagree. In real life, people don’t follow neat scripts. All the examples on the internet have quaint stories of a more prosperous person buying the “suspended” meal, and a poorer person asking for it. I have to wonder if the people creating these nice stories have ever met any inner-city poor who are truly very hungry and sleeping on the streets. First off, they don’t follow scripts. They don’t know the right thing to ask for in nice language. And I hate to admit it, but some of the very hungry who are absolutely deserving a suspended beverage are also the ones who appear at a Starbucks intoxicated and going from person to person begging for money. I have had it happen to me in downtown Seattle. I know this is not a nice clean picture that we like to imagine. But it could be reality. Baristas have plenty to do. Asking them to be the tally-keepers of suspended coffees might not work: I recognize that the examples I give will make some bristle. But in all honesty, I can see the possibility that a store will have a number of suspended coffees, and no one is entering in to take advantage of them. I can completely see the possibility that some baristas will use those suspended beverages for their favorite regulars, their friends, and however they can. Yes I know, this too doesn’t fit the perfect script. But it could be reality. And Starbucks boasts 70 million customers each week passing through their doors. This could be a nightmare to keep track off. The very poor and hungry need more than a free latte. If you’re truly very poor, you need a square meal. You need a meal program. You need a food bank. You may need a shelter. You probably need bus fare to get to a shelter or meal program. In some ways, and again this will sound harsh, this idea of the suspended coffee makes a more affluent person feel good for doing very little. This is important: There are so many ways to help the hungry! You can make a difference and help the poor and the hungry! Find a local food bank to donate your money or your time to. I apologize, but all my examples will be Seattle examples – but there are food banks all over the country! If you are in Seattle, why not volunteer at the Ballard Food Bank or the University District Food Bank? Find a large hunger relief organization to donate your time or money to. In Seattle, we’re lucky to have two such organizations. They are Northwest Harvest and Food Lifeline. These organizations partner directly with growers, and larger businesses to be able to receive very large scale food donations. And then with the help of many volunteer hours, the the large donations are repacked and distributed to meal programs and smaller food banks. Last October, I wrote an article about a number of partners who volunteered at the Houston Food Bank (which appears to be a larger, hunger relief organization). Find a meal program to volunteer at: In Seattle, seven nights a week, a person can get a meal at Operation Nightwatch. I will say, having volunteered there several times, that is some of the more difficult volunteering that I have done. Nightly, this program serves about 150 to 200 of Seattle’s very poorest individuals. It’s a rough crowd. You’ll encounter a number of people who are used to sleeping outside. It’s heartbreaking to have a conversation where you ask where someone is sleeping, and the answer is “by a dumpster.” Making a meal in an industrial kitchen, with donated food (some of which comes from Food Lifeline), and serving it to people who are noticeably hungry, IS rewarding. Or, consider donating money to a local meal program or shelter. Make a donation to a larger, national hunger relief organization: If you really cannot find anything local in your area, you can always make a donation to Feeding America, a very large national hunger relief organization. Carry a $5 Subway card or (some kind of McDonald’s card) on you at all times: In my work, I professionally interact with a number of social workers. I thought it was remarkable when a friend (a social worker) told me that she tries to have a $5 Subway gift card on her at all times. If someone really is in need, at least he or she can be given a small sandwich of their choosing. Here in downtown Seattle, there are a ton of Subway locations. If you’re in a city dense with fast food, and filled with poor, consider always carrying a small food gift card on your person. I have heard of people keeping $5 Starbucks gift cards on them for this purpose. This puts the momentum to give in your very own hands, instead of transferring that power to someone else. And at least in downtown Seattle, there is no shortage of very poor with an extended hand, asking for help. By the way, I think most urban centers have plenty of poor who are down on their luck. I saw the same thing when I lived in San Francisco from 2001 to 2004. You can do a lot to get a nourishing meal to someone who is hungry. And it doesn’t have to be an ad hoc system of hoping the right person will walk into Starbucks at the right time. You can do better than that. Coincidentally, when I noticed the “Suspended Coffee” craze, I had been in the middle of writing an article about Starbucks Global Month of Service which starts April 1, 2013. I will be writing about that again soon! In the meantime, if you are looking for some volunteer opportunities, you can check out the Starbucks Community Service page too. I hope I have given you some points to consider in response to the viral “Suspended Coffee” movement. And if you like this article, I hope you’ll consider sharing it in response to those who are championing the “Suspended Coffee Movement.” I know their hearts are in the right places. However, what sounds adorable and perfect in a short story, doesn’t always play universally well across the United States. Coffee tasting: Starbucks Peru Aladino - try it iced with oranges! The Barista is In … A book about Starbucks by Dairy Martin. Starbucks nixes the MyStarbucksIdea community: You can still submit ideas. National Pink Day: The real story of the Starbucks #PInkDrink and more pink-ish drinks reviewed. This has opened my eyes, it is very true. A coffee will not do what it is needed really!! So I found this site, when a friend sent me a link on FB about this suspended coffee movement & I googled. Personally, I find many of the responses quite selfish or self-centered. Most poor and homeless are in need of real help. THIS I totally agree with. HOWEVER, I find it interesting that nobody wants to deal with having this reality in their faces at a cafe. Yes, some of the more extreme cases of homeless and poverty bring out addiction and the associated behaviours, but the majority of people who are at this point, are because of the fact they have been ignored and never received the help they needed when things first got tough. For instance quite a few homeless and impoverished people are also suffering from undiagnosed medical problems that range from something fairly easy to diagnose & treat – like diabetes to more difficult illnesses like post-traumatic stress, bipolar disorders and the like. Many are coming from homes with abusive backgrounds, or have lived through some traumatic life experience. The issue of the intoxicated homeless person who may ask for a suspended coffee, and then disrupts the patrons can easily be handled by choosing to find a solution that actually gets them help. Suspended coffees open the door to seeing the REALITY of our current social situation in major cites across the Western world, it is up to us to take what we see and make our communities a healthier more supportive space for everyone, including those less privledged. Keeping tally of suspended coffees is an easy thing to do, as most cafes have automated registers that could easily add suspended coffee to their till & easily check in how many are given & taken. Those without automation could have two jars of suspended coffee in & suspended coffee out, that a token or some other marker (personally I like the idea of colourful marbles!) is tossed into. An easy visual way to keep track for both patrons & baristas. The surplus funds at the end of the month, if there are any, could be donated to a local soup kitchen, shelter or used to support any other project in the community that gives back. The reason I support something like this idea is precisely because it brings people back into the community who have been isolated due to harsh circumstances. When someone is really suffering, many times they feel completely hopeless and that nothing can change – a tiny bit of “normalcy” given through the “privledge” to sit in a cafe and relax for a moment, or gather one’s thoughts can make all the difference in the world. Additionally, it can be the doorway to opening to the charitable and compassionate nature of everyone in the community and in the business. This can only foster more goodwill in the community, that makes the whole neighbourhood a better place. I started handing out $5 gift cards to the homeless in Philly in 2011. Drugstores, fast food chains, and even Subway sandwich shops all issue gift cards, which can be purchased at most drugstore chains. The drugstore cards let those in need buy simple things like socks, gloves, and Band-aids. And the food cards let someone sit indoors and enjoy a meal. But I guess we won’t know that for certain. In the meantime I’ll keep handing out those gift cards. Disappointing to see so many negative reactions to what should be a kind idea. The problem with giving a “gift card” is that quite often the homeless have no place to store it and it will be lost if they don’t immediately run into the store to use it. It is unfortunate that so many have taken a nice idea and “call it stupid”. I have on many occasions been asked on the street for money and I refuse but always offer to buy them lunch/coffee whatever they need. However, many times there are people in need that are not necessarily visible to me as I journey through the city. Giving restaurants/cafes the ability to offer free food/beverage to someone in need because someone else has already paid for it is a very nice idea and Panera Cares Cafes offer just that type of service and they do it well. It has been severely cold all over the country and in my area especially. Shelters are not able to provide beds and nourishment for all in need. This is at least SOMETHING. Come on people and unless you are doing more, don’t squash a good idea that has a kind intent. I am honored requesting permission to use this article into our forthcoming book in Japan. I am sending the details via your contact form. Hope this is right direction to ask for and could have your permission at the earliest opportunity. i find myself wondering why you have decided for these “homeless drunks” what they “really need”?? I think if you spent any real time with them you would see that gift cards can be sold or traded…for what they really want! Coffee, alcohol, drugs… I sit amongst many who have been homeless and hungry but now lead productive lives…you never know what it takes to get sober/get help until you know! Maybe it’s even a free cup of coffee/a kind gesture?! I live on a small island and the suspended jar is valuable here. The cafe workers know who needs the food or drink. Some one in need will come in and ask if there is enough $ in the jar for a bowl of soup and if so, they will be fed. We also have a food bank that is available to those who need the food when in the midst of a low financial time. All these type of solutions are bandaids of course. We do our best for all who reside here. The real shame is in Starbucks not wanting to participate in the generosity of others. Those who come for the suspended coffee to warm themselves with won’t be leaving a tip, you know. I say EVERYONE needs to stop leaving tips for these over-priced coffee and unhealthy latte drinks.